The Looney Tunes Clubhouse is a reminder that a child’s life should be enjoyed and friendships are shared. Each one of us has memories of our cartoon friends Buggs Bunny and Tweety and the many others, here they are brazened across the front and sides of this unique Moonwalk. You will find yourself drifting back to younger days as you watch your guests, family, and children enjoy their cartoon friends in this Looney Tunes Clubhouse. 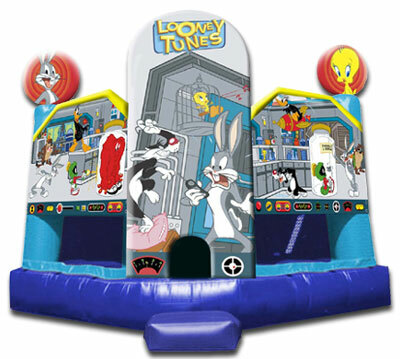 JumpMaxx prides ourselves in providing America with newer, cleaner, high end entertainment with inflatables like the Looney Tunes Clubhouse and many others.